You are here: Home / Autoimmunity / Is Your Chronically Low Vitamin D Due to an Infection? This week we explore a theory behind the potential cause of chronically low vitamin D levels. Intracellular infections may cause a process that depletes your body of vitamin D, causing a whole host of health issues. If you’re struggling with brain fog, fatigue, or you get sick often, you should consider checking your vitamin D levels. Get help with your chronically low vitamin D levels. 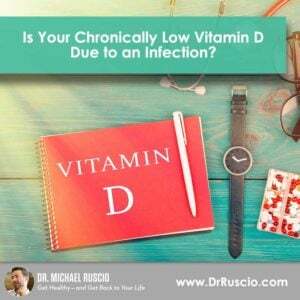 I want to share with you a fascinating and relatively new theory, which implies chronically low vitamin D levels could sometimes be caused by intracellular infections. And it’s estimated that 42 percent of Americans are vitamin D deficient. So, it’s important we get to the bottom of any theory that suggests an underlying cause for vitamin D deficiency. The theory suggests intracellular infections stimulate a process which depletes your body of its vitamin D, resulting in chronically low levels, even if there’s supplementation or sufficient sun exposure. Let’s break this mechanism down a bit. First, vitamin D gets turned into its metabolite called calcitriol (also known as 1,25 vitamin D). Then, calcitriol activates your vitamin D receptors. Your vitamin D receptors are found in nearly every tissue of your body and are responsible for important processes that keep you healthy. Certain intracellular infections interfere with the function of your vitamin D receptors in an attempt to suppress your immune system and avoid detection. Because your vitamin D receptors are important in a healthy immune system, if they aren’t functioning properly, infections get to sneak around. And it allows these infections to live inside your body relatively unnoticed. When these intercellular pathogens interfere with the function of your vitamin D receptors, your body overcompensates and uses more calcitriol trying to activate these receptors. Your body then becomes resistant to calcitriol. The consequence is your body has to pull from vitamin D stores to compensate for the calcitriol resentence. The result is your vitamin D levels remain chronically low, which, as we know, causes a whole host of health issues. One way we know this is happening is when a patient has low vitamin D levels even when they are exposed to adequate sunshine or are taking supplements. Additionally, their calcitriol levels would be relatively high. I was interested to see whether or not there would be a disparity between vitamin D and calcitriol levels. I was astonished to find about 80 percent of my patients had low vitamin D and high calcitriol. I’ve also been testing patients to see if this disparity of vitamin D and calcitriol appeared to be occurring alongside an intracellular infection, and in a majority of cases there was a coinciding intracellular infection. The next step is to see if we can correct these low vitamin D levels through treating the intracellular infection. I’m in the beginning of this process, but I’ll be sure update you on my findings. If you’ve noticed your vitamin D levels are low and have upped your sunshine exposure and/or added vitamin D supplementation to your routine with no improvement, it’s time to take a different approach. Have your doctor test your calcitriol levels and test you for intracellular infections. Vitamin D levels should be between 40 and 50 ng/ml, and calcitriol levels should be between 40 and 50 ng/ml. What I’m finding is my patients have calcitriol levels from 90 to 199 ng/ml and vitamin D levels around 40 to 50 ng/ml. That’s a significant disparity and cause for investigation. While there are some treatments for restoring vitamin D receptor function, such as resveratrol and olmesartan, I prefer to get to the root cause of an issue and treat the underlying infection. I plan to continue examining my own patient population for vitamin D, calcitriol, and intracellular infections, and I’ll update you after I find out more about this fascinating cycle. In the meantime, if you’re suffering from chronically low vitamin D, you should consider looking into this theory. Also, I want to thank Dr. Nick Hedberg for pointing this interesting theory out to me. There is another interesting view on vitamin deficiency in the book Perfect Health Diet. They point on grains consumption and co factors deficiency (magnesium) in low vitamin D level.